What is the name of this new command center powered by Dell? Its official name is the Digital Operations Center. It is physically located in the Disaster Operations Center in Washington, DC. Internally, we call it the DigiDOC. What does the Digital Operations Center do? The Digital Operations Center gives the public a seat at the table of disaster operations. The public is a vital participant in emergency response and recovery. They often are the first responders to their own neighbors, and they can provide valuable information to the Red Cross and other response agencies. Our goal is to be informed by and to become a social liaison for people, families, and communities to support one another before, during, and after disasters. 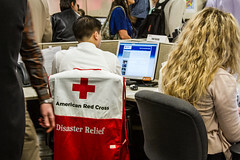 The Digital Operations Center will enhance our information about disaster situations, enable us to better anticipate disaster needs, and help the Red Cross connect people with the resources they need during emergencies. 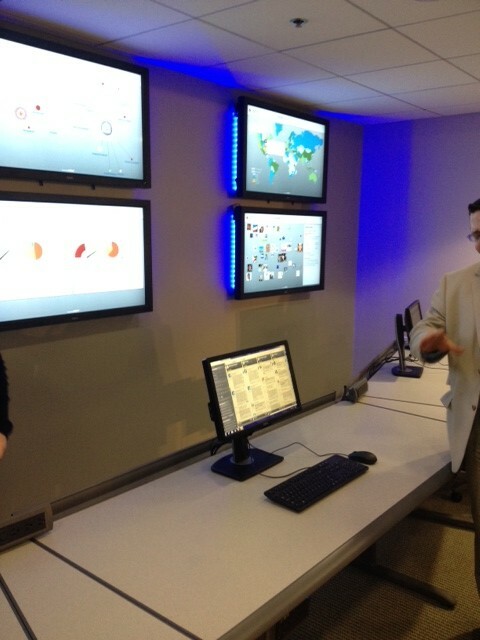 The Digital Operations Center is modeled after Dell’s Social Media Command Center. Dell provided resources and consulting services on this project. How will you know if the Digital Operations Center is effective? • Are we pulling in relevant, actionable data? • Are our efforts increasing the strength and resilience of communities before, during, and after emergencies? • Are we providing relevant services via social tools we wouldn’t have otherwise been able to provide? • Are we facilitating a satisfying and valuable digital volunteer experience? Who works in the Digital Operations Center? The social engagement team — currently Wendy Harman, Gloria Huang, and Kristiana Almeida. At least one of us will always be here or very close to here during regular business hours. Except for next week when we’ll be at a conference to train more volunteers. We do our best. During major disasters,we will bring in trained volunteers to help. Who is monitoring, aggregating, and translating to action all this data outside of business hours? Shouldn’t you be staffed 24 hours/day? While there won’t be someone physically in the Digital Operations Center 24 hours/day, we can access the data that creates the visualizations from any where. We’re lucky to have a pretty big network of supporters who will alert us when an issue needs immediate attention. At least one person will be in the Digital Operations Center whenever the Disaster Operations Center (DOC) is activated. If the DOC is activated 24 hours/day, we will be, too. How does the information coming into the Digital Operations Center get to operational decision makers? 1. 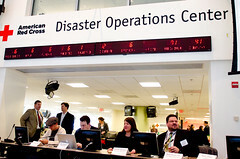 Decision makers for major disasters work within eyesight of the Digital Operations Center. They can come by at any time to get situational awareness at a glance. For this, the data is in the form of the visualizations on the 6 screens in the Digital Operations Center. We can adjust what data we’re pulling in at any time. We’re always tweaking and adapting to be relevant to what’s happening on a given day. 2. The social engagement team will report out to decision makers at national headquarters as well as to the local field operations multiple times per day when there is a major disaster. For this, the data is in the form of a summary report that includes our engagement activities as well as any trends. 3. Decision makers can directly engage with individuals. For this, the data is presented in the Radian 6 engagement console. We are able to create tailored engagement consoles so that subject matter experts are informed by people talking about their area of expertise right from their own computers. We are training a handful of them to use this software. 4. We will share this data with our partners and local operations. For this, the data will be in the form of summary reports very similar or identical to those discussed in #2. We will work with each operation to determine what data is actionable. How do you engage with individuals from the Digital Operations Center? We can holistically see all public social conversation about any given emergency. We look at what questions people have and what issues they are facing and that information informs what content we push out through our national communications channels, including Facebook, Twitter, redcross.org, emails, etc. Our digital volunteers and subject matter experts can engage with individuals via the engagement consoles they use on their own computers outside of the Digital Operations Center. For example,whenever a digital volunteer responds via the engagement console to someone asking where the nearest shelter is, all the other digital volunteers and the social engagement team will know this activity has happened. This way we don’t duplicate efforts and we can keep track of how many people we provide services to and how well we’re able to help. How does one become a Digital Volunteer? There are several steps and several qualifications we look for in a digital disaster volunteer. 1. Send an email to socialmedia@redcross.org. Indicate your interest in becoming a digital disaster volunteer and provide us with some information about your social networking activity. Please include your twitter handle and where you’re from. 2. 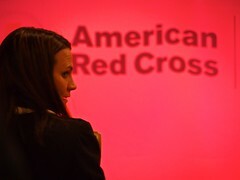 We will have you begin the process of becoming an official American Red Cross volunteer. This process includes a background check. 3. Next, we will invite you to take a social engagement training so you’ll be prepared to serve and you’ll know exactly how to use the tools and what is expected of you. 4. Then, you’re in. You may be called upon for any domestic or international disaster to serve. Where is it? The Digital Operations Center is a room physically located within the Disaster Operations Center at the American Red Cross in Washington, DC. How many screens does it have? It contains 6 large screens which show a variety of data visualizations of relevant public social conversations. How many computers does it have? It contains 3 desktop computers that power the 6 screens (2 a piece!). There’s additional room for several more laptops at the table. What software is running the visualizations? The visualizations are an application from Radian6. How many visualizations can you display? Heat Map: illustrates the volume of conversation by geography. The heatmap also displays a recent Tweet about the topic about once per minute. Community: illustrates the social profiles of individuals talking about the topic. The larger the profile photo, the more followers that person has. Universe: illustrates the volume and sentiment of conversations by keyword. We can display and compare up to three topics and their corresponding keywords at a time. Conversation Dashboard: illustrates the volume of conversation overtime, a breakdown of the share of voice within a topic, and the sentiment over time. We can display any combination of these 4 visualizations around any of our active topic profiles, explained below. What is a topic profile? A topic profile is a collection of keywords and phrases we use to search an area of interest. For example, we have a topic profile called Red Cross, which allows us to see and break down all public social mentions of the Red Cross and our mission area. We also have a topic profile called Disaster Services, which helps us keep an eye on emergency situations like fires, earthquakes, floods,tornadoes, and hurricanes, even if they don’t mention the Red Cross. When the tornadoes hit the midwest on February 28 we quickly created a topic profile to monitor and engage with people affected. How do the visualizations work? We can decide which topic profiles to display and we can decide which visualizations (heat map, community, universe, and/or conversation dashboard) to view at any time. What is an engagement console? The engagement console is a Radian6 product that helps us monitor, engage,and internally collaborate about all social conversations during a disaster. The engagement console pulls in public Facebook posts, blogs, news sites,discussion boards, video and image sharing sites, and twitter. It also serves as a workflow manager and is the tool that allows us to scale up to using many digital volunteers.More about the engagement console. What kind of social data can you pull in? We can see Twitter, public Facebook posts, forums, blogs, news sites, discussion boards, video and image sharing sites. We only pull in publicly accessible social conversations. We do directly engage with individual public social posts to answer questions, provide resources, have a conversation, and/or provide support. This entry was posted in Social Media and Emergency Management and tagged American Red Cross, Dell, Digital Operations Center, DOC, Red Cross, Twitter, Washington DC, Wendy Harman. Bookmark the permalink. This has great potential! I’m looking forward to learning more about it. Must one go to Washington to train, or is it online? Thanks for your comment. Honestly, I’m not sure. I’ll ping Wendy and ask her.